I’ve just returned from a week in Yorkshire with my other half, Mark. We stayed in Thirsk (home of James Herriott) which is on the edge of the North Yorkshire Moors National Park and has a really good fish and chip shop which gives ‘scraps’ (a northern thing it seems which consists of little bits of spare batter and is apparently the perfect accompaniment for a meal which already has its fair share of batter included!) Needless to say I declined the ‘scraps’ myself!! a trip to the Galpharm Stadium in Huddersfield to watch the Giants play the Wakefield Wildcats (that’s Rugby League). Mark also spent what seemed like all day in the Rugby League museum and described the experience as like being in heaven! I told the family all about my new venture and our niece, Megan, was happy to be the first model of a couple of my creations – thank you Megan. 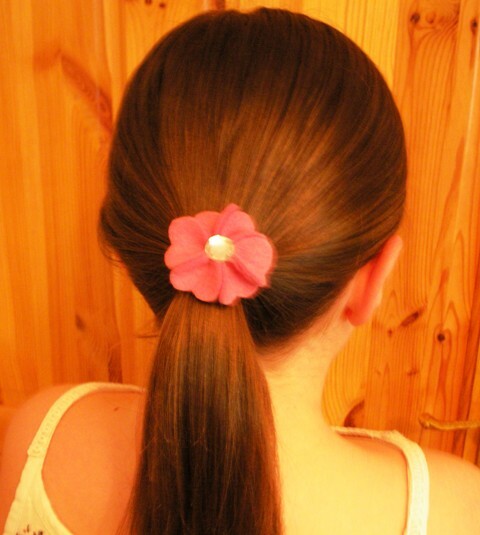 My pony tail bands are very affordable at £1.25 each – I don’t have these for sale on Folksy as I would need to put the price up considerably to cover additional costs. If you are interested in ordering one or more please contact me. 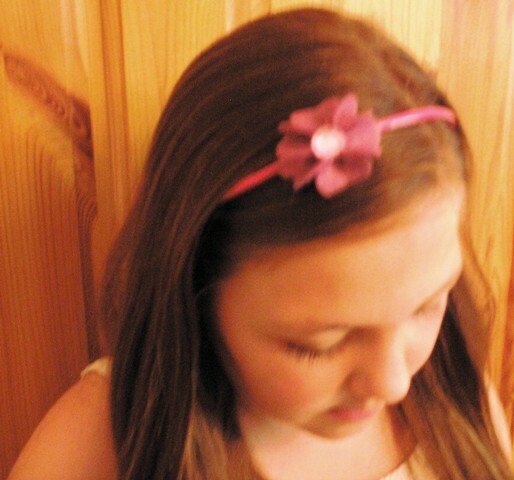 I would be pleased to do an order for party bags – they make ideal bracelets for those without long hair as you can see from Megan’s photo above. Now back to work for a rest and perhaps a bit of crafting in the evenings. I’ve always loved purple, or mauve as I used to call it. I wear the colour quite a lot and even have a purple car! 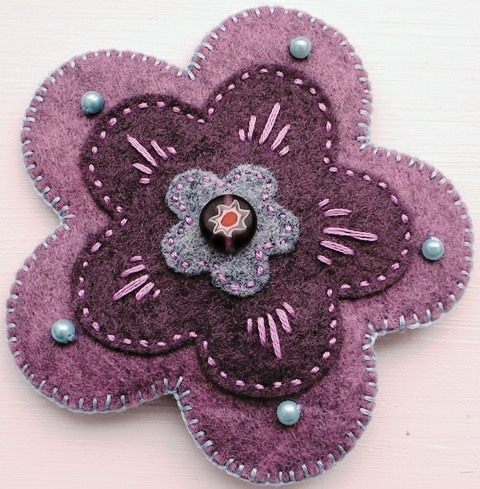 When I visited The Eternal Maker in Chichester last week to replenish my felt supplies, I was delighted to find a gorgeous purple felt – I’d describe it as the colour of Clover (no, not the spread silly!). I set out this week to create something new and decided on a flower shaped brooch combining my clover purple and a darker shade, plus a grey/blue colour and some beads. I think the centre is most important as the focal point so once I had sorted this out with a pretty little bead, the rest of the design followed quite easily. Having cut out my flower shapes in different sizes I worked from the centre outwards to sew the elements together and added some embroidery, finishing by sewing the brooch pin to the back flower and blanket stitching the back to the front in a contrasting light blue. Voila! I am really pleased with the result. Despite not having much time to be “crafty” this week, this went so well that I am now making a yellow/green version! This is the home of my felt creations, as well as our gorgeous cat, after whom my little enterprise is named – more on him another day! To start with introductions, I am Sally and I work as a part-time Legal Executive in local government. I did some craft work many years ago when my son, Andrew, was small. I enjoyed the creativity and the buzz of selling the odd thing, but I was never going to make my fortune. I gave up, disappointed that I wasn’t going to be an entrepreneur, but pleased that I’d had a go. Years on my aims are more realistic – it’s all about producing something a little bit different and hopefully better quality than what you might find on the high street. It’s about making an item that someone will love enough to want to part with their hard-earned cash, will happily wear, use or give as a gift. It’s also about me enjoying what I do. I’ve been having great fun creating my felt brooches, hair accessories and clips since January and have now moved on to embellishing tote bags. Here are a few pictures of my creations; I hope you like them. 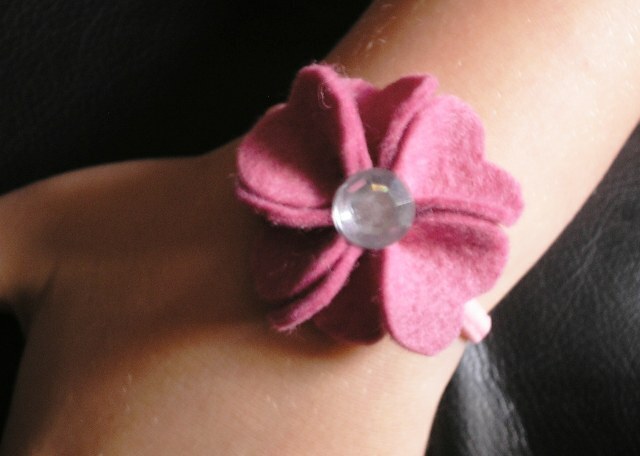 Now available on Folksy … !